LotaCorp introduces ‘Istinja Turtles’ Lota Nothing gets you cleaner than 4 green turtles joining in on the action! Four green turtles help you out after you dismiss your four green turtles. 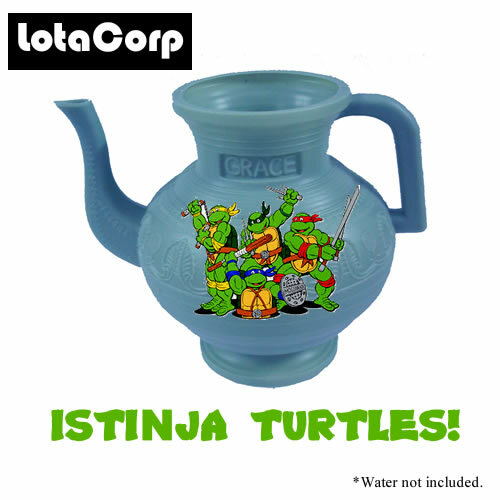 SUNNYVALE, CA – Riding the wave of this summer’s blockbuster release, LotaCorp (NASDAQ:’LOTA’) unveiled its new ‘Istinja Turtles’ style lota. Four eager, heat-transferred turtles (of the mutant variety) are ready to take on your wet and wild adventures. The machine-crafted lota is made of durable plastic, and comes with LotaCorp’s patented right-hand “SURE GRIP” handle. To date, no left-handed models have been announced. “With this product, we’re telling children that if the turtles can keep their sewer system clean, we should all keep our sewer systems clean,” said the 36-year-old CMO as he gestured his hand below the waste area. A previous model made of wood was recalled, as it caused master splinters.